Natural scientist and universal scholar Hermann von Helmholtz lived an incredibly productive life dedicated to science. He represented a scientific approach that bridged the disciplines of medicine, physics, and chemistry. Back in the 19th century, Helmholtz’s research work was often groundbreaking, combining theory, experiments, and practical applications. He gave many of his university lectures without using formal lecture notes. However, he did occasionally reach into his pocket for a notebook during his presentation so he could look up a scientific fact or a name. 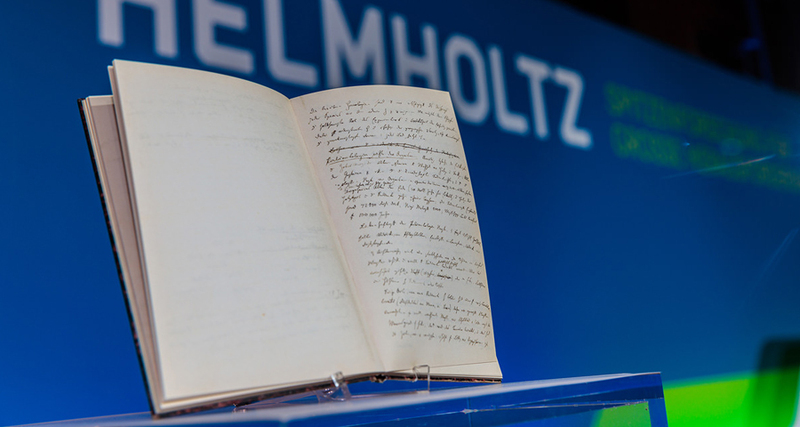 In 2017, the Helmholtz Association received a special gift – an original manuscript in the researcher’s hand. The text had been the property of the Helmholtz estate and is likely one of these special notebooks. Its title is "Allgemeine Resultate der Naturwissenschaften. Biologischer Theil". History professor and Helmholtz expert David Cahan offers an initial scientific assessment of its content. This notebook (Notizbuch), now belonging to the Helmholtz-Gemeinschaft Deutscher Forschungszentren e.V. in Berlin, is one of a collection of about two dozen or so other notebooks that together constitute a small part of Hermann von Helmholtz’s entire literary remains (Nachlaß), much of which is held in the Archive of the Berlin-Brandenburgische Akademie der Wissenschaften. Among much else, the Akademie Archiv holds Helmholtz’s unpublished lectures or notes on epistemology, the history of science, individual scientists, and the general nature and results of science (see Helmholtz Nachlass, or HN, 702–721). This newly revealed notebook at the Helmholtz-Gemeinschaft, in other words, is historically a part of the group of notebooks at the Akademie. Helmholtz led a full and productive life (1821-1894), one that among much else was distinguished not only by the high quality of his scientific work but also by its breadth of subject matter. Though he was principally a physiologist and a physicist, he also made important contributions to ophthalmology (medicine), psychology, mathematics, atmospheric physics, theoretical chemistry, chemical thermodynamics, metrology, the scientific foundations of music, and more. Furthermore, from 1853 onwards he gave occasional popular or philosophical lectures on the nature, goals, and methods of the sciences, and he was a strong advocate of and contributor to the popularization of science. For these and other contributions to German culture, he was ennobled by Prussia in 1883. During the 1860s and 1870s, at both the University of Heidelberg and the University of Berlin, Helmholtz occasionally offered a lecture course entitled, like the notebook under discussion, "Allgemeine Resultate der Naturwissenschaften." This notebook, subtitled "Biologischer Theil," is the complement to a notebook entitled "Physikalischer Theil." (See HN 720). It was Helmholtz’s (university) lecturing practice to address his student audience, without employing a formal, written text. In the midst of lecturing, however, he would often pull out of his pocket one of his notebooks so as to recall or confirm a specific scientific fact or name or the like. The fact that the present notebook contains numerous intermittent blank pages suggests that Helmholtz purposely left these pages blank so as to record additional notes on a given topic as he conducted his scientific readings over the course of a number of years. The present notebook, like its counterpart HN 720, is devoted to the general results of the natural sciences. In both, he invoked the law of conservation of energy and its consequences as his guiding theme to present and connect most everything in science with the whole. Included here are physical, astronomical, geological, climatic, and meteorological phenomena, the evolutionary lives of plants and animals (including man), and general cosmological topics. In the present notebook, furthermore, he records detailed biochemical, histological, comparative anatomical and physiological, paleontological, anthropological, geological and biogeographical results, all aimed at helping to explain evolutionary developments. Indeed, this notebook in good measure invoked Darwin’s theory of evolution by means of natural selection as his (other) guiding theme. The fact that he cites what appears to be the second edition of Darwin’s On the Origin of Species (1860) but does not cite Darwin’s The Descent of Man (1871); that he belatedly added in the discovery of the element indium (1863); that he cited William Thomson’s (Lord Kelvin’s) work on the cooling of the earth (done mostly in the mid-1860s); that he cited Louis Pasteur on the problem of spontaneous generation (work also done mostly in the mid-1860s); that he cited Peter Pringsheim’s botanical work (of 1869); and that he did not cite any date later than 1869 — all this together suggests that Helmholtz probably composed this notebook over a number of years between 1862 and 1869, and that he (first?) used it to give lectures at Heidelberg on the "Allgemeine Resultate der Naturwissenschaften." Finally, it may be mentioned that Helmholtz quoted (see PDF S. 7) a fragment of what was perhaps his favorite line of poetry, from Friedrich Schiller’s "Der Spaziergang" (1795): "Sucht das vertraute Gesetz in des Zufalls grausenden Wundern,/Sucht den ruhenden Pol in der Erscheinungen Flucht." For Helmholtz, the natural sciences always had to be based in empirical phenomena, but at the same time their ultimate aim was to find nature’s laws. David Cahan is Charles Bessey Professor of History at the University of Nebraska–Lincoln and the author of Helmholtz: A Life in Science (Chicago and London: University of Chicago Press, to be released in August 2018).